Now here’s one I haven’t quite figured out. 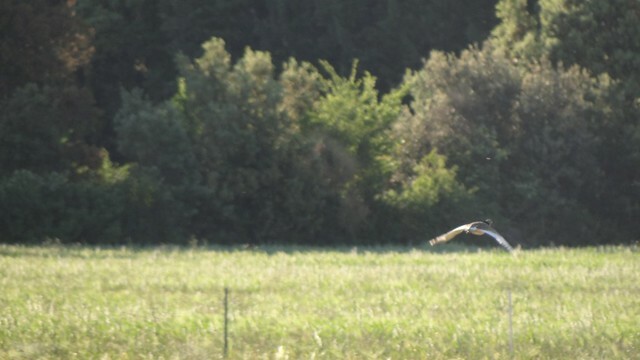 Betty and Lorinda and I were watching little bustards last week near Eyguières when I happened to ask a French birder if he had any idea where the odd vernacular name “canepetière” came from. Just making conversation, don’t you know, and I hardly expected an answer — but he had one. A convincing one. “Cane,” he told me, was a name for “duck” (as in “canard,” for “drake”), and “petière” — well, let’s just say that that word refers, indelicately, to the reedy buzz, the “pet,” uttered by the bird on taking flight. 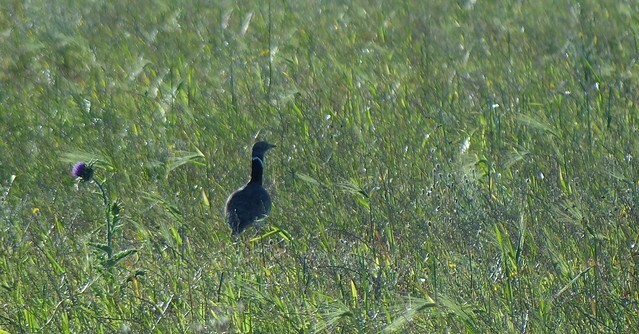 six roasted cows, three heifers, thirty-two calves … 140 pheasants, some dozens of wood pigeons, river birds, teal, bitterns, curlews, plovers, partridges, daws, redshanks, lapwings, shelducks, spoonbills, herons, coots, egrets, storks, “cannes petières,” flamingos, turkeys…. It pays to be careful when reading Rabelais. Though all of the other bird names on the menu seem to be “genuine” — that is to say, they are well attested in earlier sources — it’s eminently possible that here, buried in this avalanche of words, is a specimen of our author’s famous carnivalesque wit, an example of the verbal playfulness that makes reading Rabelais so much fun and so much frustration all at the same time. I wonder, in other words, whether Rabelais didn’t make the name up. 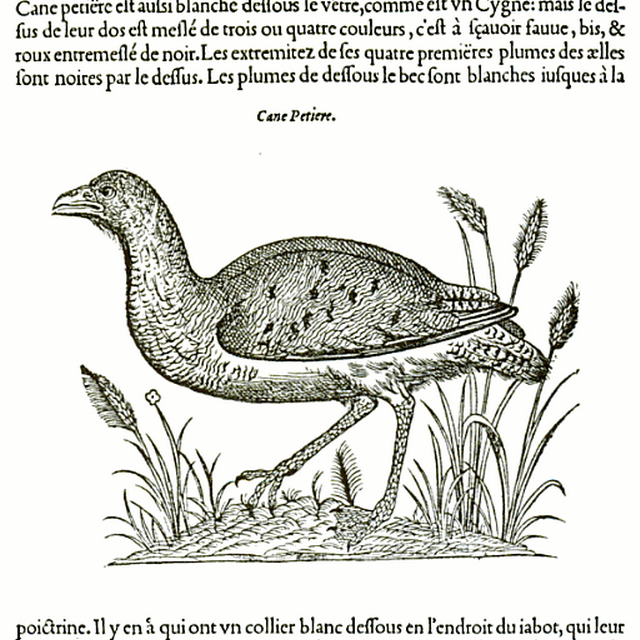 The fact that it does not appear in print again for another twenty years (in the ever-so-serious Pierre Belon’s Observations) suggests at least that “canne petière” did not enjoy great currency in the written language; Belon did use it, though, without etymological comment, in the species account he prepared for his 1555 Histoire naturelle des oyseaux. 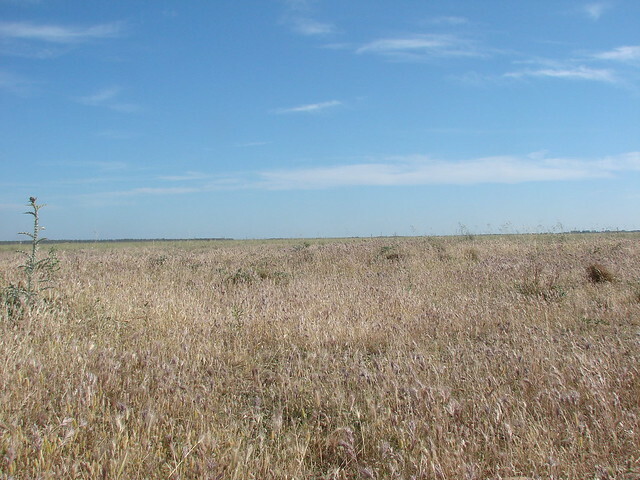 such as, for example, the steppes of the Crau. 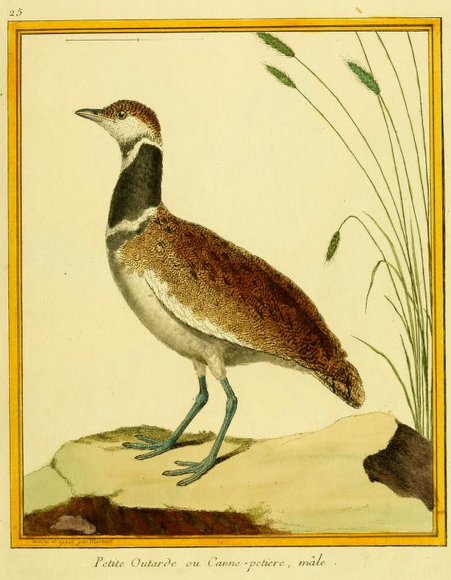 from the bird’s “flatulence” … which seems to be based solely in the similarity of the word “pet” [to the word “petrace,” for “rocky”]: no naturalist has ever brought up anything of the kind in his account of the bird…. I suspect that Buffon and Salerne are right, and that “canepetière” has its origin in the transformation of the genuine name “canepetrace.” The question remains whether that distortion was an intentional literary pun or the result of the phenomenon known as folk etymology. Myself, I wouldn’t put it beyond Rabelais.